Igloo Products Corp., the nation’s largest cooler manufacturer, has expanded its Marine Ultra cooler bag line to include a new product—the Marine Ultra 36 Can Console. The new silhouette fits in most boat consoles as well as under seats, which is a priority for many anglers and boaters. It is also light weight, yet extremely durable with excellent ice retention--two days. According to soft-sides product manager Melissa Poole, the new addition to the Marine Ultra line was a natural extension. “The new silhouette is designed to fit in most boat consoles as well as under seats, which is a priority for many anglers and boaters. It is also light weight, yet extremely durable with excellent ice retention,” said Poole. Like the rest of the Marine Ultra line launched in the spring of 2013, the 36 Can Console features an easy to clean and durable tarpaulin exterior, UV protection and anti-mildew, and ultra-thick insulation. The ultra-thick antimicrobial liner is puncture and leak-resistant. The Console has an adjustable, removable shoulder strap with a comfort pad, comfort grip side handles, and a quick hatch lid on top provides easy access to the cooler’s contents. The Marine Ultra 36 Can Console will be available at retail in the spring of 2014 with an MSRP of $44.99. 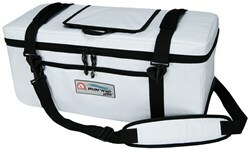 For further information about the Marine Ultra cooler bag line or about any other Igloo product, contact Katie Davis at KDavis(at)igloocorp(dot)com or visit the company’s Web site at http://www.igloocoolers.com. Founded in 1947, Texas-based Igloo Products Corp. is today an international designer, manufacturer and marketer of outdoor products that make the outdoor experience more accessible and fun. So whether it’s on the water, near the water, on the trail, on the hunt, in the mountains or just around the house for family fun, Igloo goes where you go and makes the experience better. For more information on Igloo, visit the company's web site at http://www.igloocoolers.com.